The Department of Health will be hosting a week long series of events starting on Monday [April 9] recognizing Public Health Week. 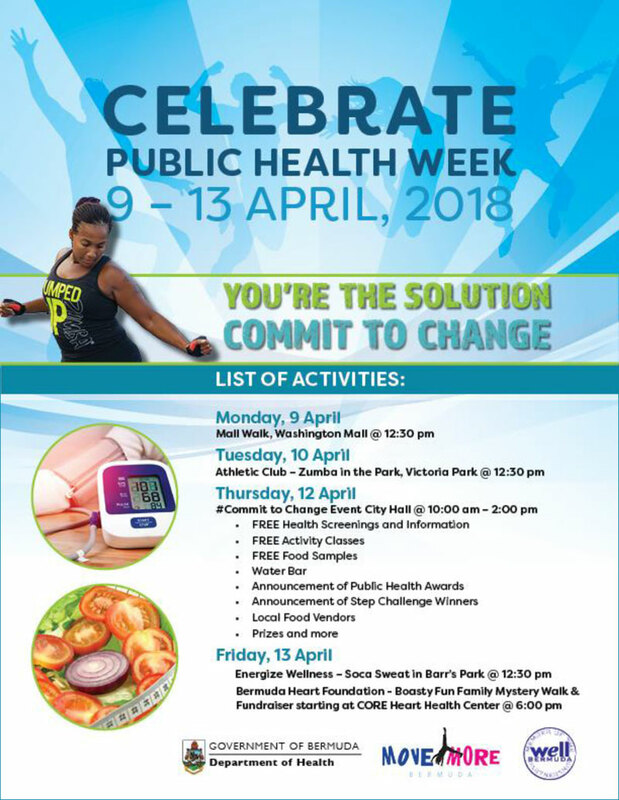 A spokesperson said, “Public Health Week features a number of events, including one of the largest free health screenings on Thursday as part of initiatives to promote healthy lifestyles. “Themed “You’re the Solution: Commit to Change”, the Thursday event is scheduled for City Hall between the hours off 10am and 2pm, and will be opened by the Minister of Health Kim Wilson. “There are 10 booths planned offering a list of free health screenings. Thursday’s event will also include music, food, prizes and activity classes, including Yoga, line dancing and pole fitness. “It also will feature Public Health Award Announcements. “Monday’s activities include a lunch-time Mall Walk through Washington Mall. Tuesday has the Zumba in the Park, with The Athletic Club leading activities in Victoria Park.